Howard Nichols (1894-1977) performed his spectacular hoop-rolling and hoop juggling act in theatres around the world in a career that spanned over 50 years. He attended the IJA conventions in 1950 (Elkhart, Indiana) and 1951 (Williamsport, Pa.), and was the feature closing act in the public show both years. (For further information, see the article by Joan Nichols on the Nichols-Nelson Troupe in the Nov./Dec. 2006 issue of Juggle magazine.) 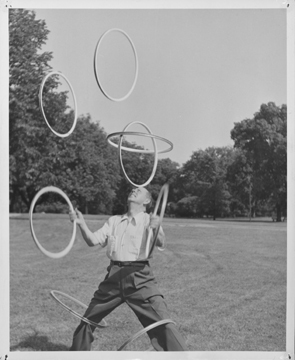 In this photo Howard Nichols juggles four hoops while balancing two on his forehead and spinning one hoop on each leg. Date/Location: 1950 IJA Convention, Elkhart, Indiana.